Saudi authorities detained one of the Kingdom's most prominent businessmen and the head of the National Guard in a sweeping anti-corruption inquiry that gives Crown Prince Mohammed bin Salman more authority. Billionaire Prince Alwaleed bin Talal, who owns investment firm Kingdom Holding, was among 11 princes, four ministers and tens of former ministers detained, two senior Saudi officials told Reuters on Sunday. A top security official, Prince Miteb bin Abdullah, was detained and replaced as minister of the powerful National Guard by Prince Khaled bin Ayyaf, consolidating Prince Mohammed's control of security institutions which had previously been headed by separate branches of the ruling family. News of the purge came in the early hours of Sunday after the Custodian of the Two Holy Mosques King Salman bin Abdulaziz Al Saud of Saudi Arabia, decreed the creation of a new anti-corruption committee chaired by his son Prince Mohammed, who has swiftly amassed power since rising from obscurity less than three years ago. The new body was given broad powers to investigate cases, issue arrest warrants and travel restrictions and freeze assets. Many analysts said the goal of the purge went beyond corruption and aimed to remove any potential for opposition to Prince Mohammed as he pushes an ambitious and controversial reform agenda. In September he announced that a ban on women driving would be lifted and he is trying to break decades of conservative tradition by promoting public entertainment and visits by foreign tourists. In economic policy, he has slashed state spending in some areas and plans a big sale of state assets. "The most recent crackdown breaks with the tradition of consensus within the ruling family whose secretive inner workings are equivalent to those of the Kremlin at the time of the Soviet Union," wrote James Dorsey, a senior fellow at Singapore's S. Rajaratnam School of International Studies. "Nonetheless, the dismissals and detentions suggest that Prince Mohammed rather than forging alliances is extending his iron grip to the ruling family, the military, and the National Guard to counter what appears to be more widespread opposition within the family as well as the military to his reforms and the Yemen war." An economist at a big Gulf bank, declining to be named because of political sensitivities, said nobody in Saudi Arabia believed corruption was at the root of the purge. "It's about consolidating power and frustration that reforms haven't been happening fast enough," the economist said. Other people detained in the probe include former finance minister Ibrahim Al Assaf, a board member of national oil giant Saudi Aramco; economy minister Adel Fakieh, who once played a major role in drafting reforms; former Riyadh governor Prince Turki bin Abdullah; and Khalid Al Tuwaijiri. 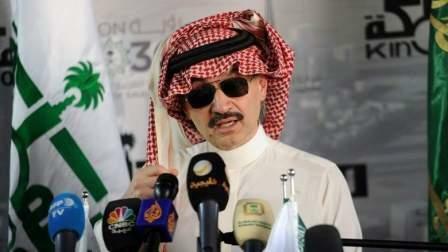 In addition to Prince Alwaleed, who is one of Saudi Arabia's best-known international businessmen as an investor in firms such as Citigroup and Twitter, people detained included Bakr bin Laden, chairman of the big Saudi Binladin construction group, and Alwaleed Al Ibrahim, owner of the MBC television network. Some detainees were believed to be held at the opulent Ritz-Carlton hotel in the diplomatic quarter of Riyadh, sources in contact with the government told Reuters. The hotel and an adjacent facility were the site of an international conference promoting Saudi Arabia as an investment destination last month. The detentions followed an earlier crackdown in September on political opponents of Saudi Arabia's rulers that saw some 30 clerics, intellectuals and activists detained.